WHEN: Show to open May 1st, Opening Reception, Thursday, May 2nd, 5 to 7 p.m.
EMERGENCE/SEE is the inaugural show of the Meadowbrook Arts Camp. Envisioned by two residents of the Meadowbrook Housing Complex in Florence MA, the camp was founded on the belief that each person IS art. What we do with paint, clay, music, pen or dance is an extension of ourselves. The art works are conversations we have with our world and with each other. Each child who participated in the MAC had the opportunity to go on a journey into and through their own emerging “voice”. The paintings and photographs are vivid and vibrant, contemplative and connected. 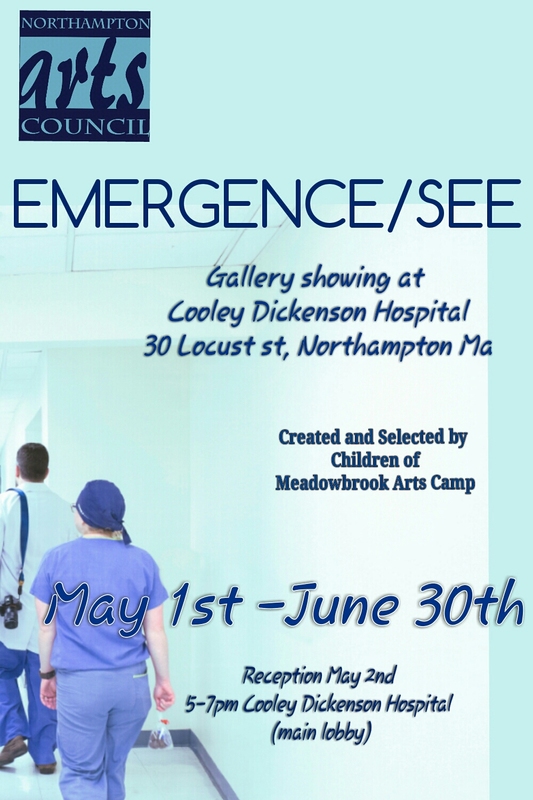 The first year of the Meadowbrook Arts Camp was underwritten by the Northampton Arts Council. In kind support was provided by various individuals in the community and by Edwards Church and First Churches of Northampton. In addition, the Northampton Arts Council provided funding for a guest artist, Sylvia Boston Johnson, and her Intergenerational doll workshop.